When zillions of 'family values' eaters lined up to support Chick-fil-A on August 1, many conservatives felt the turnout signaled a victory for free speech and Biblical values. While those folks may have won the battle on that day, they didn't (and won't) win the culture war. Fried chicken just went back to being delicious as the chain promised to stop "supporting organizations with political agendas," which includes anti-gay groups--a move that's gotten them back into a Chicago's good graces. We learned the news by way of Chicago's The Civil Right Agenda (TCRA) an LGBT-rights advocacy group, who report that Chick-fil-A has penned a letter saying, "The WinShape Foundations is now taking a much closer look at the organizations it considers helping, and in that process will remain true to its stated philosophy of not supporting organizations with political agendas." That letter was addressed to Chicago Alderman Joe Moreno, who along with Boston mayor Thomas Menino, said they would block the chain for its anti-gay views. WinShape is the chain's not-for-profit charitable arm that had previously donated to groups opposing gay marriage. TCRA adds, "In meetings the company executives clarified that they will no longer give to anti-gay organizations, such as Focus on the Family and the National Organization for Marriage." While it's likely that CEO Dan Cathy still hasn't changed his anti-LGBT views, and while Chick-fil-A is in no means pro-equality, it is indeed a victory for humanity in that one of our more delicious fast food chains is no longer funneling its profits into organizations that actively discriminate against the LGBT population. 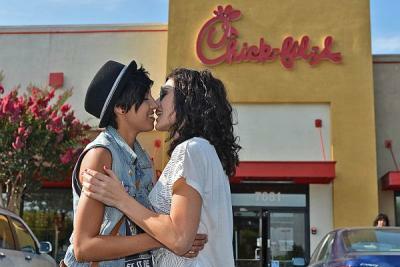 Will the religious right now boycott Chick-fil-A for caving to the gay agenda?